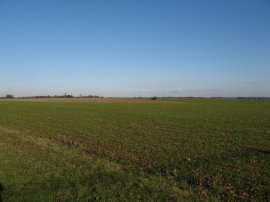 After a break of two months I was finally back walking along the Harcamlow Way on 3rd January 2010. 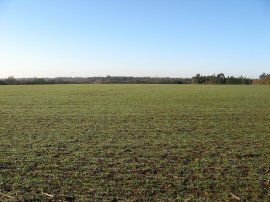 It was a cool, bright sunny winters day with hardly any breeze and much of the ground remained frozen through the day. I drove up from Walthamstow and parked in a small layby outside Takeley FC. 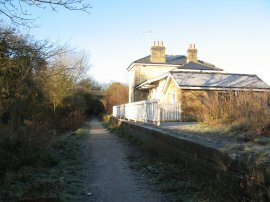 From there I headed a short distance up the road before turning to the right along a road that leads down to the Flitch Way by the old Takeley Station, photo 1, the remains of the old platform still very much visible. The Flitch Way runs along the former Bishops Stortford to Braintree railway and I headed along this for a short distance before taking a footpath off to the left that runs down over fields towards Bush End to reach the point where I had finished my previous stage of the walk along the Harcamlow Way. The path I had been following was actually the Harcamlow Way and thus I then set about re-tracing my steps back up between the fields to the Flitch Way again. I was walking more or less parallel with the incoming flight path for Stansted Airport and there was a steady stream of planes coming in to land a mile or so to my left over the fields, photo 2. Back at the Flitch Way, photo 3, I headed straight across the route of the old railway, heading alongside a newish housing development to join the B1256 in Takeley. 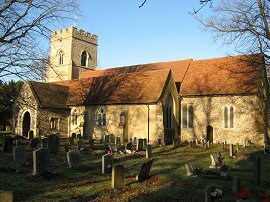 The route heads to the left along the road before taking a narrow track on the right that runs up to Holy Trinity Church, Takeley, photo 4, which judging by the singing coming from inside was busy with Sunday worshippers. 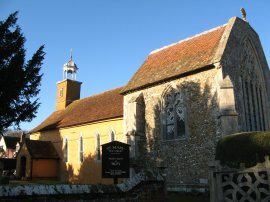 Once past the church the route joins a footpath that runs between fields up to the A120 dual carriageway. 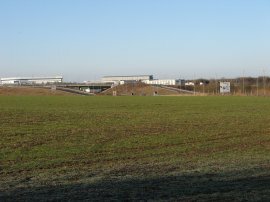 Across the fields to the left of the path were the equally busy buildings of Stansted Airport, photo 5. The route then runs alongside the rather noisy and less tuneful dual carriageway, crossing over Parsonage Road, and heading up to another, and as far as I can tell unnamed, road. Here the route joins the road, turning to the left to cross over the dual carriageway. 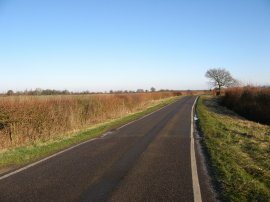 The Harcamlow then follows the road, photo 6, to the hamlet of Bamber Green, continuing ahead along Cobbs Lane when the road bends round to the right. Cobbs Lane soon becomes an un-surfaced track, photo 7, which leads out into open fields. Continuing ahead the route enters a small band of trees where the footpath crosses over the River Roding, photo 8, narrow enough at this point not to require a bridge to cross. 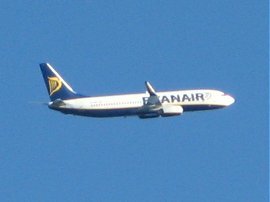 All the time I was walking this stretch of path there was a steady stream of planes passing overhead including the Ryanair flight in photo 9. From the river the footpath heads across a couple of more fields before passing through the edge of Middlefield Wood. The path then heads alongside one more field to reach another unnamed lane where the route continues straight ahead. 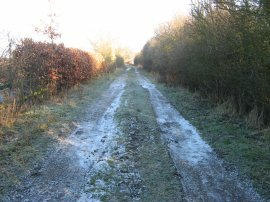 The road surface was very icy and was the only place during the walk where there was any remnant of the recent snow falls, compacted to an icy layer on the road surface in the sunken parts of the lane. 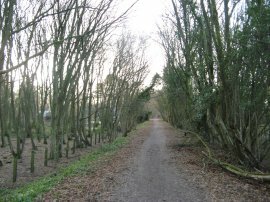 After about half a mile the Harcamlow Way takes a footpath on the left that heads downhill to cross over a small stream. Once over the stream the path runs gently uphill through an area of paddocks from where a very icy stile led out to another road. 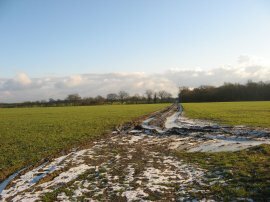 Here the route heads more or less straight across, joining a footpath that runs out across the wide open fields that I often encounter when out walking in Essex, photo 10. Reaching a field boundary the route turns to the right and then follows the field edge round to the left, passing between more fields to eventually reach the road at Tilty. To the right I could see the village of Great Easton and ahead in the distance Duton Hill. At the road the route heads to the right before turning down the narrow lane that leads to the Church of St Mary the Virgin, photo 11. 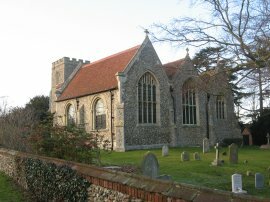 This a rather unusual church with a wide chancel and much smaller nave and was originally the chapel for the Cistercian Abbey of Tilty. 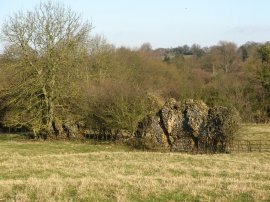 The abbey was founded in the middle of the twelfth century and was dissolved in 1536, now all that remain of the buildings are a small section of wall located in the field behind the church, photo 12. At the far side of the field is the remains of an abandoned 18th century watermill, photo 13. This mill was built on a tributary of the River Chelmer on the site of the earlier monastic mill of Tilty Abbey. 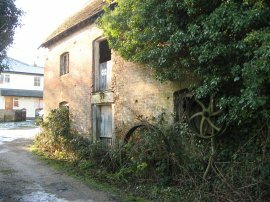 The mill still contains all its original machinery intact and in 2008 planning permission for a housing development was refused. Meanwhile the mill remains overgrown and neglected. Hopefully at some point a way will be found to allow it to be restored back to working order, the building being rather more impressive than my photo shows. Turning right past the mill the route heads up to a patch of woodland, Eseley Wood, where the route turns to the right, running along the edge of a stream to reach a road on the edge of Duton Hill. Crossing the road the route heads up the road opposite which is where I finished this stage of my walk along the Harcamlow Way having walked 6.67 miles from my start point at Bush End. The route takes the footpath on the left that can just be seen signposted in photo 14, however I continued ahead through the village as I started to make my way back to the car in Takeley. Having walked through the village I took a footpath on the right that headed downhill beside a field edge to cross over stream before climbing gently uphill on the other side of the valley, the path running between open fields from where there were good views back across to Tilty where I had been walking a short while earlier, photo 15. Approaching the top of the hill I turned right along a path that soon led to a grass covered field which the footpath headed diagonally over to reach Great Easton. This was a very picturesque little village however the low angle of the bright winter sunlight made it impossible to take any decent photos. Not far past the church I joined a footpath on the left that ran down a narrow path besides a house before heading out into open fields. I followed this path as it headed downhill over a couple of fields before continuing ahead alongside the banks of the River Chelmer. At Fleck Bridge I crossed over the River and headed up between fields to reach the village of Little Easton. On the opposite field edge there was a man with an incredibly smoky fire that was covering a large part of the village in quite thick smoke. It was unusual as I could not see any flames and the smoke seemed to be billowing up from very close to ground level. 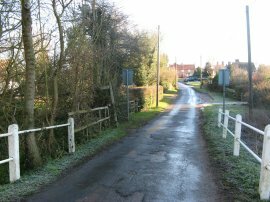 In the village I turned to the left along the road for a short distance before taking another footpath on the right. 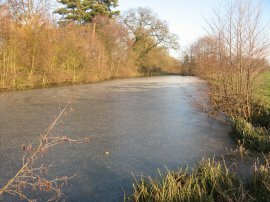 I followed the path round two sides of a playing field before crossing a sunken area which appeared to be being used as a rubbish dump and then continuing ahead alongside a large garden to reach Long Pond, photo 16, its surface covered with a thick layer of ice. 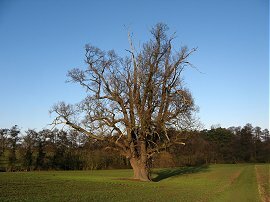 From the pond I headed uphill along a grassy track that ran by the large old oak tree in photo 17, towards Little Easton Manor. Skirting the Manor House buildings I joined another very ice covered road by St Mary Church in Little Easton, photo 18. 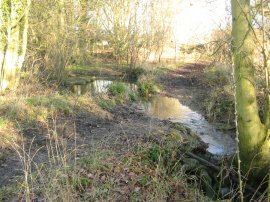 I followed the road for a short distance before joining a footpath that ran past the Rectory Ponds out onto a field edge track. As the path heads gently uphill it starts running alongside a narrow area of woodland and where this wood ends I joined another track that headed off to the right, photo 19 was taken at the junction of the paths and shows the frozen nature of the ground. I followed this track out into another field where the route turns half right, roughly following a line of electricity pylons running just in from the field edge down towards another crossing track however before this was reached I had to cross a shallow drainage ditch that had a fair bit of water flowing in it when I went past although I would think that it is more usually dry. Here I turned to the left along a driveway that ran down past a boarded up lodge house and on to take a bridge over the new A120 dual carriageway before continuing a short distance down the driveway to reach the old A120 Stortford Road by Strood Hall. 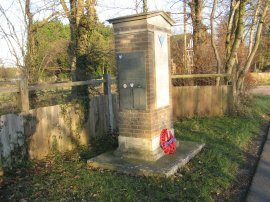 The area I had been walking over was close to the site of the World War 2 RAF Station Great Dunmow and on the main road there was a small memorial to the men who had served there during the short number of years it was operational, photo 20. After heading down the road for a hundred yards or so I joined a footpath on the left, which headed over a small section of field, to rejoin the route of the Flitch Way. This was the only section of path I encountered on the walk that had not been re-instated since it had been planted. 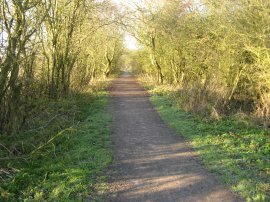 Once on the Flitch Way I turned to my right from where I had a two mile walk along the flat level track back down to Takeley Staion, photo 21. Back at the car I had walked a total distance of 15.2 miles although my legs felt as if it had been much longer. This was the longest walk I had done for a while and the hard ground also probably didn't help. Still it had been a very enjoyable walk in ideal winter conditions. 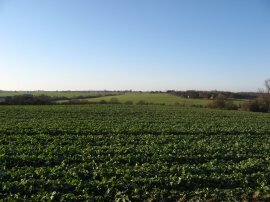 I have uploaded the route of the walk which can be accessed here Harcamlow Way 3 Route. I was very impressed with how it looks when opened in "Earth".